Soundscape’s composition (stereo), also to be adapted for a multi-channel sound installation. Produced by Kunst Radio (AT). First prize as best soundscape at the sound art competition “Piars”. “The waves we are talking about when we’re on the radio are a special kind of waves that are able to ruffle the ether, this fictional substance within which the electromagnetic resonances of disembodied voices and sounds propagate. But there is a wave domain which extends on a different plane, which moves and stirs a different matter, perhaps a denser matter, a matter in which the sound runs faster, sound travelling across continental distances bringing echoes of unheard depth. This is clearly the sea. A huge, unstable, resonator that is continuously evolving. 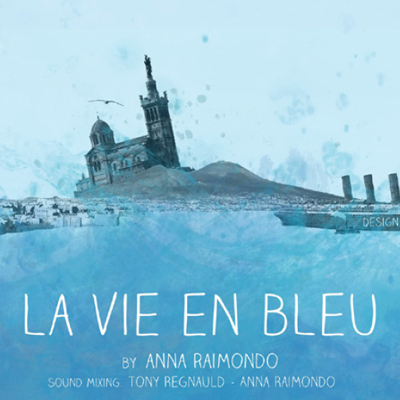 The sea is the main character of the piece by Anna Raimondo entitled “La Vie en Bleu” (Life in blue). The sea is a strange variant of the radiophonic ether with its continuous wave-cycle, capable of creating pathways and connecting distant places. In this case, the two marine cities of Naples and Marseilles. They become the terminals of a radio bridge that extends under the water.